. . . for reminding the country this week and for the coming months that corruption is alive and well in "successful" cities like you. ADDED comment 1/31/2006: I say "Thanks" unsarcastically. I really am glad that people are being reminded that New Orleans doesn't have a monopoly on corruption. On corruption, I don't think Houston is any worse than any other city. At least Houston has a mayor who has stepped up for displaced people. All I ask is that people remember the persistence of human fallibility. It felt lousy and ridiculous to hear holier-than-thou "leaders" from other states making it obvious that we would have to beg for aid or investment here after Katrina because of "our" corrupt ways. 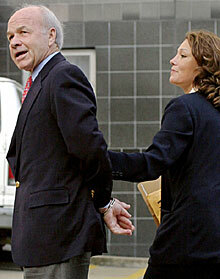 Meanwhile, the House Majority Leader resigns in shame and a large source (Lay, direct and indirect) of Bush campaign money in 2000 (when a few dollars might have made the difference that got him elected) goes on trial for cooking the books to cover up a failed company's earnings record. If disaster strikes your city or town or region, do you want your most unscrupulous citizens' sins held against you?
. . . the Bush administration refuses to support the plan of Representative Richard Baker, Republican of Louisiana, which would give everyone the capacity to rebuild and which had the backing of the mayor, the governor and the state's Congressional delegation. (To add insult to injury, two days after the White House shot down Mr. Baker's proposal, President Bush suggested at a news conference that Louisiana's problem was the lack of a plan.) Instead of an alternate solution, the president's Katrina czar, Donald Powell, has offered sleight of hand, touting $6.2 billion in development money for Louisiana passed last year by Congress as if it were somehow a substitute. In previous posts, I have consigned Mayor Nagin to the graveyard, his plot right next to those of Governor Blanco and President Bush. I am having a bit of a change of heart. 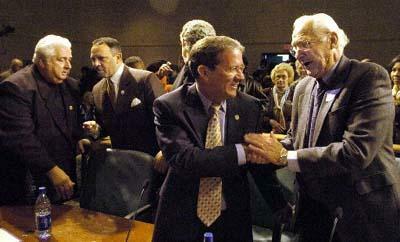 I have recalled that Sheriff Harry Lee of Jefferson Parish has been re-elected repeatedly. The loudest critics of Mayor Ray Nagin's "God bless our Chocolate City" remarks have been suburban Jefferson folks. It is notable that the profiteering company making t-shirt money off of Nagin's comments is located in Kenner. I am willing to bet all of my earthly possessions that the vast majority of these Nagin critics have voted for Harry Lee on a consistent basis. Now, Harry Lee has made national headlines (when it was harder for metro NOLA folks to do so) by justifying routine stops of blacks in rinky-dink cars in welloff white neighborhoods. I don't recall any kind of apology from him for saying that. Nagin has made repeated and heartfelt apologies that ring true, based on his experience of being absolutely pounded by displaced Orleanians at frequent town hall meetings he had led. I hate what he said and how he said it (that hellfire-Farrakhan tone didn't suit him), but I am impressed by his apology. 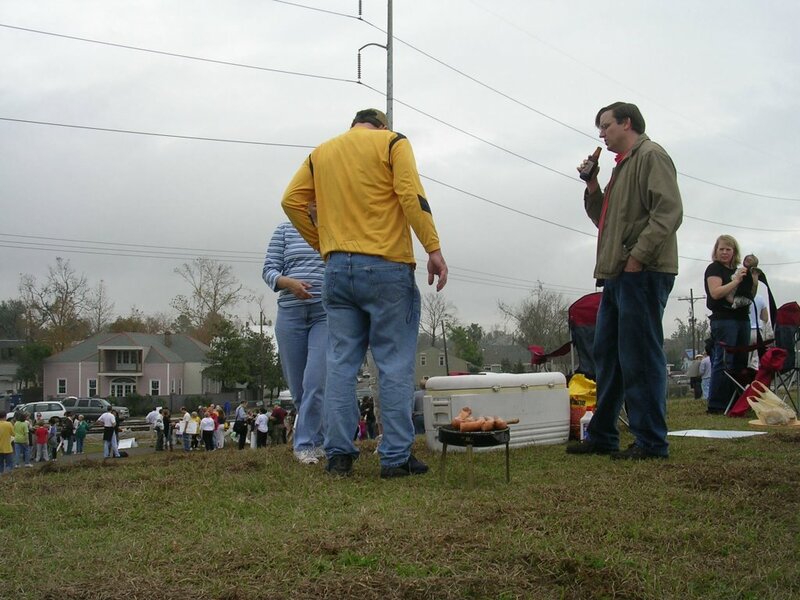 I am also generally impressed by many of his efforts around the city pre-Katrina. I don't think one can turn this place around in a week, but he had some good things going. Thus, in the end, I'm still willing to consider voting for him, depending on who else is running. The City Council, however, should be OUT, across the board. Oliver Thomas is the only one I would consider keeping. Two days after I ate some oysters and sausage on the levee at the Carrollton measurement station, and two weeks after I asked the appropriate question, the Times-Picayune has chimed with an analysis of how the river levees performed. Their answer is that the levees performed very well. My impression on an initial quick read of the article is that the sliver by the river, including my speck of the sliver, was never in danger. There were threats, however: ten-foot waves, breakaway barges, and cracks in the concrete in the NOLA-area; compromised I-walls further downriver; south of Port Sulphur, total overtopping (but no breaches) and devastated communities. The Times-Pic's pronouncement is that the city was well-protected from the River during Katrina. I feel somewhat reassured. I wish I felt completely reassured, but I keep thinking of the people on Gentilly "Ridge" who felt reassured for so many years. Our determination to obtain confidence-inducing levees will endure. Pix from the levees.org-sponsored demonstration about the Army Corps' work on levees in our area. 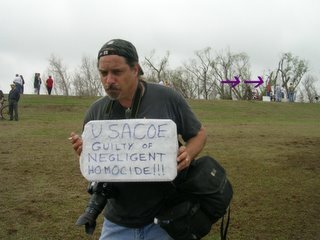 (Purple arrows point to angry bloggers in distant shot.) I don't know the photographer dude, but his face sez it all. Boy, these people look threatening. You wouldn't want to mess with bloggers (and mrs. bloggers) when they're angry. Or hungry. The menu included grilled, locally produced Manda sausage and grilled locally harvested Theriot oysters. A new dish was created by Berto: grilled oysters topped with Gulden's mustard and sauerkraut. The dish was warmly recieved by the police officer tasting squad and rally attendees alike. 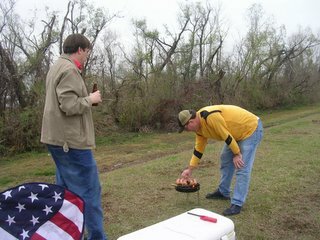 Please note no beer was consumed by any officer or military personnel at the rally. 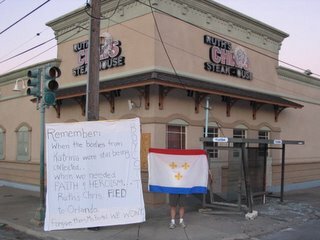 Please note: American flag-emblazoned folding chair was Berto's living room furniture while in Katrina exile in Hammond. Thanks to RestorationAle-swilling Oystah for the link to the pix. I attended the first "After the Storm" forum at Loyola University New Orleans the other night. It was a virtually packed house. Susan Spicer, Eddie Bo, John Biguenet, and Lolis Eric Elie, along with some academics, discussed the future of New Orleans culture. Lolis made an important point: New Orleans culture is surviving and will survive. He said he had used a worried tone in asking Ellis Marsalis about New Orleans culture's future after Katrina, and Ellis was completely dismissive of the question. "The culture's not going nowhere," Ellis replied. "It's still here." I was struck by another crucial point (not centered on culture) that John Biguenet made. Katrina proved that four years after 9/11, we now know that we are in no way prepared for a disaster (manmade, Qaedamade, Corpsmade, or otherwise) in even a medium-sized American city. Mayor's office folks had to break in to Office Depot to get equipment just to stay in touch with Baton Rouge. Why doesn't every mayor of the top 100 cities in the country have a federally issued satellite phone, checked weekly for functionality? Is this so difficult? The hacks in charge in D.C. sold us a bill of goods--the MBA presidency, corporate efficiency, accountability. We should have known there was trouble when no one of consequence lost his or her job after 9/11. This post is not fraught with world class positive energy. I know. I just believe that we must remember: the President and his fellow Republicans in Congress made 9/11 out to be a defining moment for America. They were right. It has proven that we are too lazy, financially incestuous, comfortable, and self-satisfied to learn from past mistakes. In so many ways, New Orleans and the rest of the Gulf Coast are straws in the wind for much of the rest of the country. Coastal erosion, habitat loss, environmental pollution, lax preparation for catastrophes--these are not uniquely New Orleans things. Does anybody out there understand that? Or are they too busy? Please understand, America: nobody has your back. Better to understand that now. We had a retreat. We had time to place value on the best of the city. From the Hubig's lemon pie at the Orleans Superette to the shredded corned beef poboy at Liuzza's By the Track, we had a vision in the desert. Each of us knew what the city was about....the kind of appreciation for others and what differences bring to the feast of a city in which we live. JazzFest with only one food booth would be poorly attended. Any snowball stand with but one flavor..............etc. Let's get past the unimaginable remark of an overworked employee. When the coach explains his job, he says "I quit." Walking out of the office, he reconsiders. Sticking his head back in the door he says, "When's our next game?" Let's get through this and on with the rebuilding legislation and funding that must happen soon! Orleanian Redheads: We Need Strawberry, Too! "This city will be a majority African-American city. 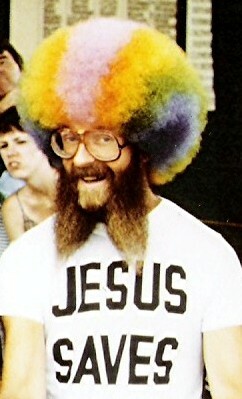 It's the way God wants it to be." "It's time for us to rebuild a New Orleans, the one that should be a chocolate New Orleans. And I don't care what people are saying in Uptown or wherever they are. This city will be chocolate at the end of the day." "How do you make chocolate? You take dark chocolate, you mix it with milk, and it becomes a delicious drink." "We ought to be Neapolitan, fudge ripple, all the flavors together. Who really cares what the racial makeup of the city is as long as it works for everybody?" That's right: Oliver Thomas, making room for redheads like me. We'll need room for pistachio, too. That would be seasick people. It's a clean sweep now. We need a new President, a new Governor, and now a new Mayor. I like the symmetry there. This will be a World Class country before you know it. IT'S ABOUT THE LEVEES, STUPID! Simple, with a great spot for a demonstration. "In a way, something like this might give the new New Orleans something to shoot for, in the rebuilding. . .. They keep this place much cleaner. I've walked down Bourbon Street, and there's a little different odor." I wouldn't defend every odor in the Quarter as necessary, but Ms. Quinn doesn't get it. My response: No, we'd prefer to be World Class, not Walt Class. If somebody can state our case better than this, I'd certainly like to see it. The Dutch solution isn't magic. It requires funding, hard work, commitment, funding, funding, and commitment, and hard work. The President made it clear yesterday that he's capable of none of these. Tim, the gentleman who makes the case, has an awfully clear voice for somebody who lost his house and car. How come the homeless guy can see things so clearly, and the guy who lives in the White House can't? I think I know the answer. What is the sound of Three Bands Jamming? Wow. 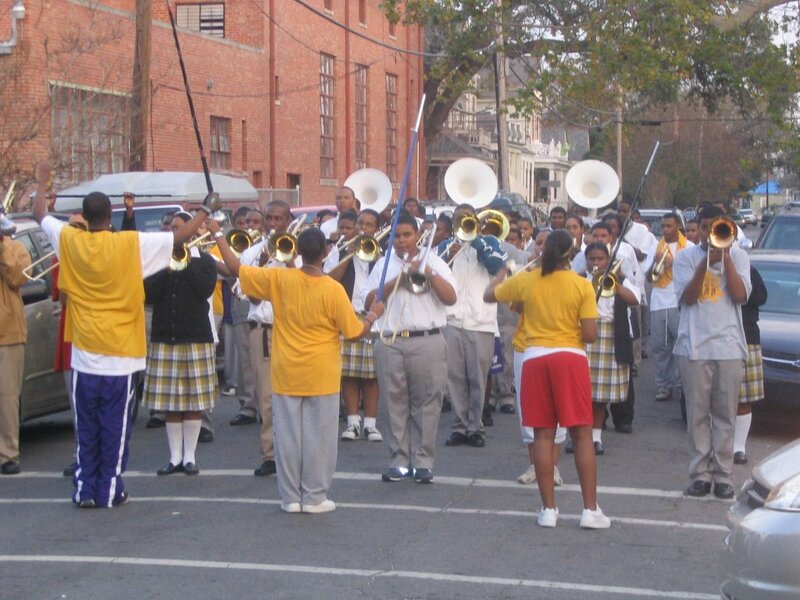 Three NOLA high schools with GREAT bands have been forced to band together in my neighborhood. Many of these kids lost homes; some lost relatives in attics. 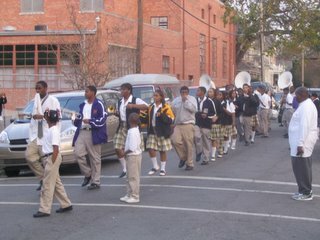 St. Augustine and St. Mary's students are currently attending school on Xavier Prep's campus. The unified institution is called the MAX School. 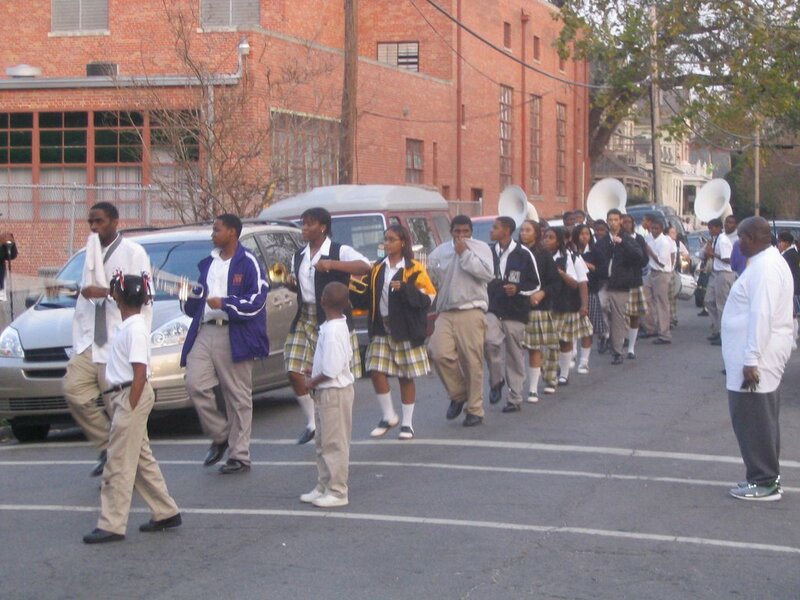 Xavier Prep's principal told me that a lot of these families are enduring the worst of post-Katrina New Orleans. This school is truly making the best of a terrible situation. 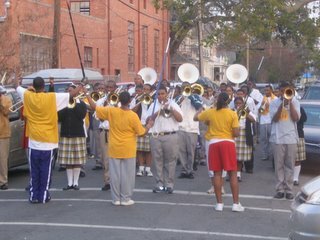 Yesterday they had a band practice on the street. It was a beautiful thing. Carnival was in the air, even if there is still too much pain and rubble in the streets. Rode my bike over with my 2-year-old and snapped these. Too bad you can't hear what it sounded like. Thanks to John McCusker from the Times-Picayune, who took this great picture. 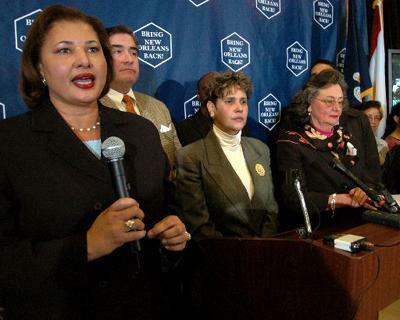 Pictured are four members of the City Council assembled to bash the plan for rebuilding New Orleans. These are the same folks who spent precious Council time on Monday unanimously voting to take a position on who should be interviewed for the Saints' coaching job. The city is in crisis, and these folks are voting on a sports team's coaching vacancy. Then they expect us to listen to them on serious issues. I look forward to a brand new, World Class Council by summer. Then these people can go to Parasol's all day long to debate NFL vacancies. I just hope they clear out of there by nightfall, so I can go have a drink with Frankie. My usually upbeat colleague Berto has important words about how our beloved City Council spent its time on Monday. Check it out. How Close Did Uptown Come to Getting Hosed? It's harder to find exactly what would constitute overtopping. The comment from Anonymous indicates that 20 feet would mean overtopping. Thus, based on what I can figure as an amateur, my house missed getting flooded by a little more than 4.5 feet of surge. I don't really know exactly how much more storm that would take. 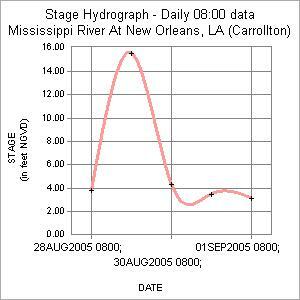 The other issue, of course, is that those measurements assume that the levees wouldn't break. After all, the 17th Street Canal did not overtop; it failed. Like everyone else, I look at levees with new eyes now. They're not infallible. Interestingly, the Corps' website says that the record level for Carrollton was 21.27 Feet on Apr 25, 1922. Does this mean that there was a flood there in 1922? If anyone out there knows, please educate me. Obviously, if anyone out there has real expertise in this area, I welcome an education in this area. I'd love to know what it would take to flood my house on Camp Street in Uptown New Orleans. You can get the data yourself at this link. What a great day yesterday (wish I had been there)! All the former mayors of New Orleans joined the current regional chief executives, congressional delegates, and the New Orleans City Council for a unity day. I seen them rich boys crying for trailers.... Them rich boys is all trailer-trash now. What Katrina did, baby, she brought us all down to the same level. The NIMBY people in Orleans, Jefferson, and St. Tammany really need to think about that. Those of us with unflooded houses got lucky, period. The river wasn't far from overtopping its levees; if it had, Uptown would have Lower Ninth style devastation. Despite all of the problems, I sense good things coming very soon. We're going to get it right here, and then people are going to want to come back or move here for the first time. Had some King Cake last night. Tasted real good. Inspiring news from the Crescent City Steakhouse: when I drove by the restaurant on Broad a few days ago, I noticed a pile of discarded shingles in the parking lot and rubble on the sidewalk. (Several weeks ago I noticed a light on inside the place, despite the boards on the windows outside.) Clearly, something was going on. 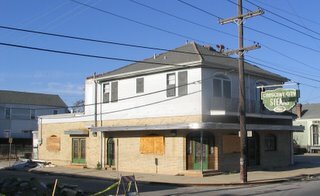 Yesterday I called Tom Fitzmorris, Mr. Food on WSMB radio, who said that the Vojkovich family is definitely working on reopening. YES! 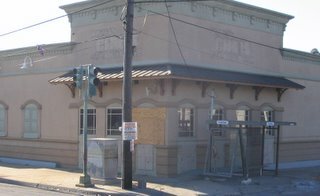 Apparently, part of the delay is that the Crescent City still had the original kitchen equipment installed in the place in the 1930s. As Mr. Fitzmorris pointed out, when you haven't looked at a kitchen equipment catalog since the 1930s, it might take awhile to figure out the lay of the land. To understand the excellence of the Vojkovichs' commitment, please consider their "neighbors," Ruth's Chris Steakhouse just a few blocks away. I think it is clear that a decision has been made. Please, anyone who reads this: eat your steak at quality establishments, World Class establishments--not cut-and-run establishments. Also, please check The Third Battle of New Orleans, where Seymour D. Fair has several GREAT posts on the Ruth's Chris debacle, including pictures of the new HQ in Orlando.